The SP500 ended up closing right at resistance today and if that breaks we should see an all time high for the SP500. The Dow made an all time high today and I am assuming there will be several more before the market finally takes a break for the summer. Also, I wanted to add to yesterday's post about the NASDAQ since it represents a sector that was previously leading the broader market. Basically, the broader market can easily go higher without technology or financials for that matter. There has been market rotation in the past few weeks and industrials are leading now. And to make my point just look at the multi-year chart for the NASDAQ and the SP500. The NASDAQ made its all time high back 2000 or 14 years ago and it has never been able to come close to testing it, in fact the NASDAQ is 20% below its all time high today. At the same time, the SP500 is 20% higher than its previous significant all time high during the financial crisis. Money rotates from sector to sector, simply as that. Now with that said, the GDP numbers for Q1 are troubling. The stock market goes up when the economy grows so if GDP doesn't pick up asap, we will see a substantial correction once reality sinks in. For now, there's optimism and no point in fighting it. If anything, one should profit from it. The market has gone up as expected but still needs to break the 1884 resistance level for a break out and a possible challenge to an all time high. There are several bullish patterns in place and trends are green so we'll see if the market confirms as soon as tomorrow. 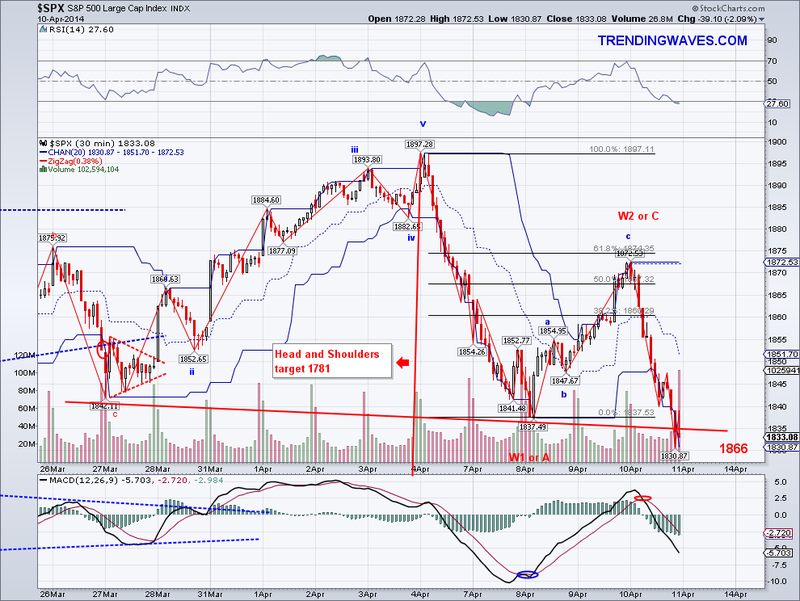 Also, I wanted to talk about the NASDAQ since there is a bearish Head and Shoulder's formation there. The reason I don't put too much emphasis on the NASDAQ is because it is dominated by tech and biotech, which is just a part of the overall market. Just as I don't put as much emphasis on the DJI or Transports which made a post financial crisis high today. 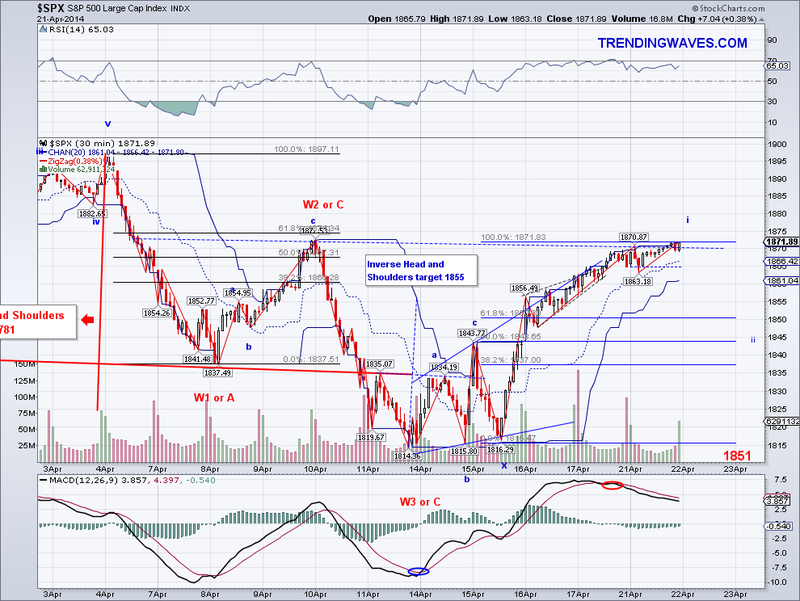 I try to get a balanced view and that is why I track the SP500 for general market sentiment. I sold half the longs I picked up at 1860 to position trade in case there is a deeper micro w2/right shoulder of the smaller ISH. The Feds and the data coming in the next few sessions should be able to move the markets decisively. The market was volatile today with a gap up at the open that was reversed to put in a new low and then reversed again to close over the 50 DMA and the Trend Average. And now that the proper Fib retracement area has been reached, the market needs to mount a rally to break out of resistance to confirm a bullish W3 that will put in an all time. My guess is once the NASDAQ gets it together, the markets will be able to rally in unison. The NASDAQ could turn out to be a drag on the markets on continued weakness but as long as the main trends are bullish and prices above the TA, I am keeping my bullish positions. Also, as I suspected Putin is just taking his time before making his next move so maybe when he finally decides to do something it will cause the summer correction? The count I posted yesterday was obviously wrong as we got the sell off I had been hoping a few days ago to test the Trend Average and the 50 Day Moving Average (1858). The are several layers of support under the 50 DMA and they could be tested before seeing a renewed rally. With today's sell off, we now have the right shoulder of the Inverse Head and Shoulders which now projects to 1942 given then where the right neckline is. So if the pattern is correct, we should see a strong rally starting next week to put in an all time high and perhaps a significant top in May before the summer correction. The excuse for the sell off is Russia and I am thinking Putin will not really do whatever he plans to do until he has a sense of how committed the West really is in intervening in Ukraine. Prior to being President, Putin spent his life in intelligence so I am sure he is very careful with his calculations. Also, considering his background in Judo (I trained in Jiu-Jitsu) and how that philosophy might affect his thinking, he will be probing for weakness to find leverage (Judokas don't win using strength, they win by using leverage). So my guess he will not be starting a brute force type of war (which would cause a major sell off) but rather wait it out and then do his next move based on what he perceives as weak points. Bottom line is, there might be posturing by Russians over the weekend but no real escalation until I sell the longs I bought today at 1860! lol.. I am taking the loss on VXX for miscalculating so I'm at (+30/-7). The market seemed like it was going to break out early morning due to positive earnings news but it tested resistance again before going back down and putting in a low at 1870 and bouncing back. I am counting that as an B and C followed by a 1-2 set up, which would imply a break out tomorrow out of the recent trading range. We do have the Russian issue escalating in the background and the market in need of a deeper correction but one more push up would make the wave look much better. That and the fact that it will allow me to buy back VXX cheaper! We finally saw a small pullback today in the market but so far it's looking like a W4 correction, which implies another bullish wave is coming that could take out the all time high before making a significant pullback. The level to watch is the 1873 level, which served as resistance previously. If support doesn't hold then we should see the Trend Average tested. I forgot to mention yesterday that there is a bullish cross (and buy signal) on the daily MACD, which normally means the market is about to start a sustained rally. I sold VXX today to position trade as I suspect there's another bullish wave coming. If that doesn't happen, I will be going long at the TA and take the loss on the VXX. The market managed to break the 1872 resistance level and as expected ended up challenging the 1883 level. At this point the all time high is only less than 1% away so if 1883 breaks decisively we are looking at a new all time high. However, I am still expecting a correction for the right shoulder of the IHS or basically a W2 so we'll see if it will come at all. So far the wave from the bottom has been very impulsive and it could well turn out to be one of those stand alone W3s we've seen a few times before. The best hope for bears given the wave structure is a megaphone top with the entire structure from 1737 topping after one more all time high. 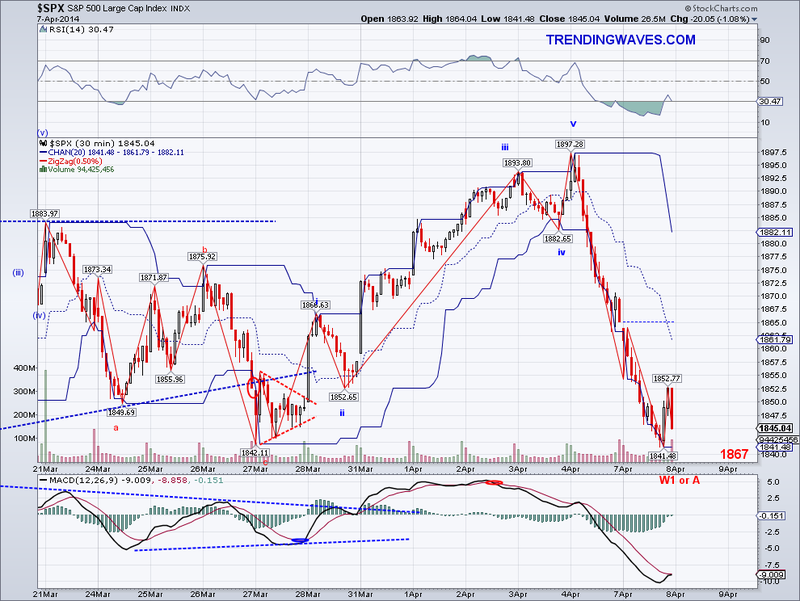 Best case for bulls is this is W1 of a 5 wave count which projects to SP 2000 in the next few weeks. A middle of the road projection would be an Rising Wedge that will top in the 1900's. I am holding a VXX bag at this point so still hoping to get rid of it on a good pullback. Not much to add today other than 1872 being technically reached by the end of the session. 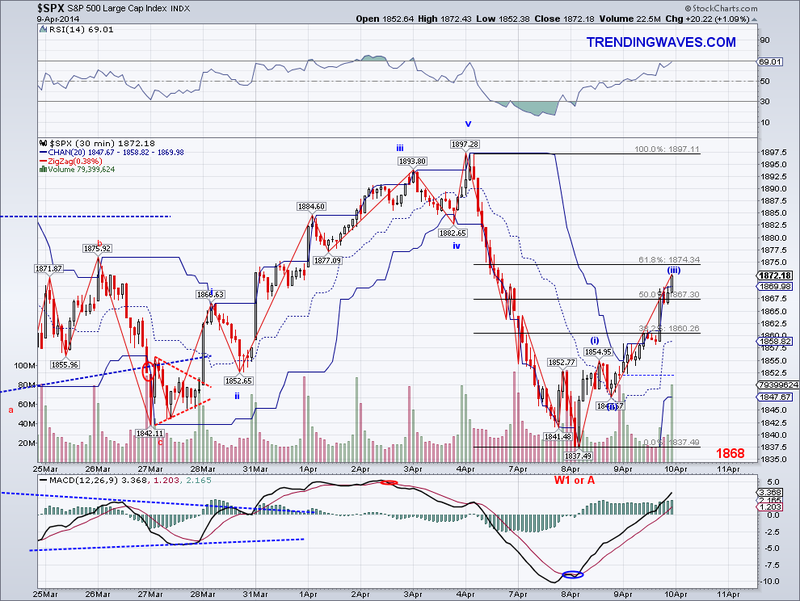 I am still expecting (and hoping) for the right shoulder of a potential IHS to form. 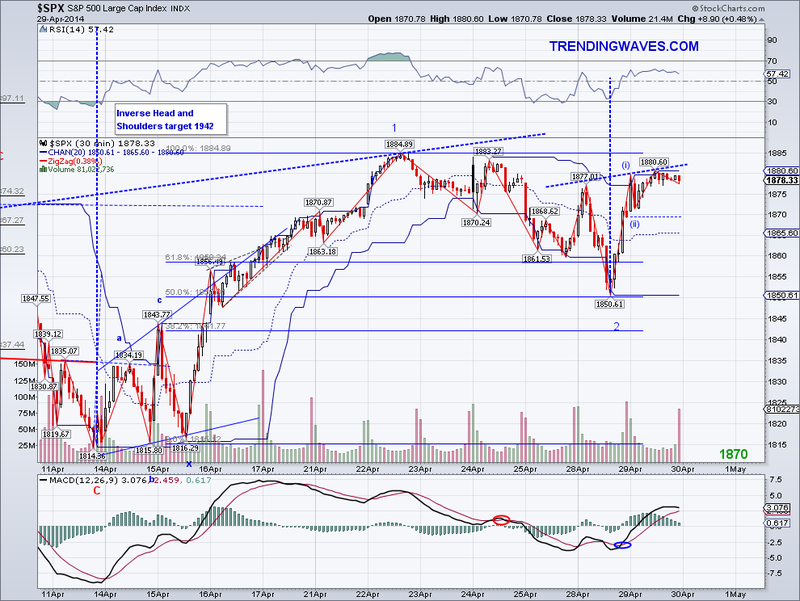 So maybe there will be some selling tomorrow to that take down the market to the TA. However, if the 1872 level breaks then we might be looking at 1883 or even the all time high before any significant price correction. The TA is back to green so all is clear for a bull run as long as the TA holds on the pullback. I am still holding VXX but will sell half to position trade if resistance breaks. - So per my statement, today's rally topping at 1869 qualifies as a sign that the market is going to take out the all time high. I am now just looking for the correction/W2 to unload the VXX position and go long. Had Google and IBM missed earnings last week the market would have probably reached sub-1800. But despite these announcements, the NASDAQ was actually rallying more than all other major indexes. So it looks like we're headed for 1900+. The short term trend and intermediate trend are still yellow but they will likely turn green early next week. The bear camp will need a bearish miracle or something from Russia to get back the lost momentum. If you are short, you want 1837 to break to balance out the bullish run from the last couple of days. The market continued to rally past the 50 DMA today and its peak is high enough to form the neckline for another Inverse Head and Shoulders that targets 1920. 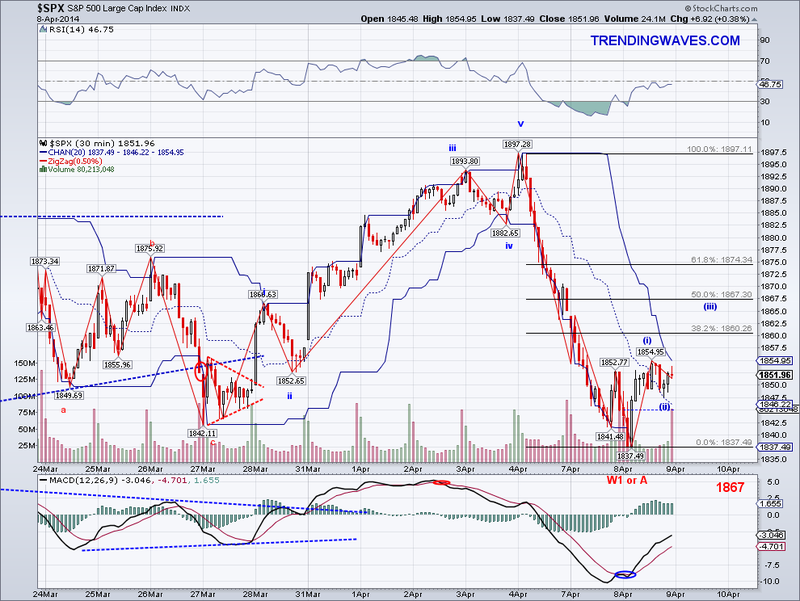 Also, going by my wave calculations, if this leg from yesterday's low is a W1 then 5 waves will end in the 1930 range. So the things have turned around somewhat for the bullish case but the critical part comes in the coming correction, which should start in the next session or two. If we get a successful test of the Trend Average and the 50 DMA, it is very likely that the bull run will continue. Bears must break and close under 1837 to keep their case alive. I am underwater on my VXX but I will be selling hopefully at break even or a profit if the bears do their job. There are good excuses to sell tomorrow (Google and IBM miss), so if bears fail to gain momentum with these news then it will be time to go long. The market tested the 50 Day Moving Average early as I had speculated yesterday and the market sold off to test yesterday's lows only to reverse and test the 50 DMA again. I had expected the original test and the sell off but the hard bounce was somewhat of a surprise. The market seems to be putting in an ascending expanding triangle which in itself is rare and one that I don't recall seeing before. Usually, these sort of triangles serve as corrections so it might be setting up the market for another ABC move to new lows. The Intermediate Trend will most likely go negative in the next session or two unless there is some sort of explosive bullish rally so we might see violent moves in the next couple of days. I lean bearish as long as price action above the 50 DMA is not sustained and until that changes I am looking for lower lows. I bought VXX around the test of the 50 DMA early morning and had a good profit couple of hours later. I normally would have closed the position as I tend to be conservative with locking in profits but I let it run and at EOD the position became negative. I am however holding it and hopefully I'll sell it on another wild market swing. The market put in a bottom in pre-market that was not seen in regular trading hours and that low tested the 1812 equivalent before rallying in 5 micro waves to 1834 before reversing to test the recent cash market low of 1814 and bouncing right back from there. 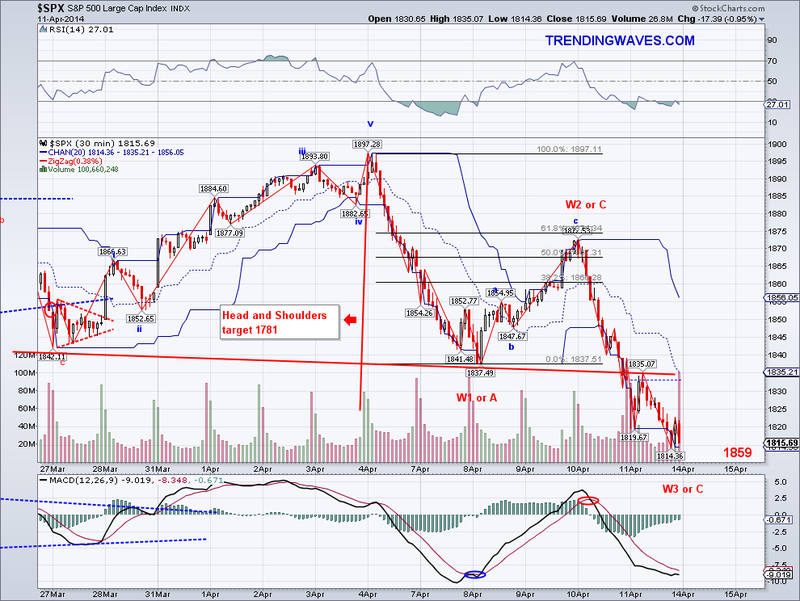 The SP500 looks like it is either putting an ABC correction before resuming a strong bearish wave or is starting a bullish impulse with the strongest wave coming in tomorrow or Wed at the latest. The problem however is that the low in the NASDAQ (which has been leading the sell off) was breached today so that count can only be an expanded flat (ABC move) and the SP won't be rallying without the NASDAQ. So despite the fact the market has bullish signals that points to a test of the 50 Day Moving Average at 1845 to an Inverse Head and Shoulder's target of 1855, I wouldn't bet on it just yet. In order for bulls to retake ground lost and turn things around the market will need to make it to 1870 before correcting. The sell off continued today and bottom came close to the 1812 level I mentioned yesterday as the ideal target for the C wave so we should get a better idea next week if this sell off has been a correction or part of a bigger correction. If we get a bounce to the 1837-43 area and reverse, then it is likely that the bottom will be in the sub-1800 level. However, a counter rally that reaches 1872 will be setting up the market for the resumption of the bullish trend and consequently new all time highs. Either way, there's a good change for a counter rally (or reversal day) on Monday as the market has sold off a bit too fast on no news. I bought a position in the pharma stock I was trading few weeks ago and XIV at the bottom today. I am not going to get greedy so I am just looking for 1837 to sell them both at a profit (unless we get something outrageously bullish). The risk for taking a long position at this point is if we get a bearish W3 with no sub-divisions then I'll have to sell at a loss on Monday. I was already ahead on XIV by EOD but I decided to roll the dice.. add some excitement to the weekend..lol. The market got pummeled today, specially the NASDAQ which ended up down 3%. I was looking closely at the 50 Day Moving Average for the SP500 but that was lost as well so the picture is clearly bearish at this point. 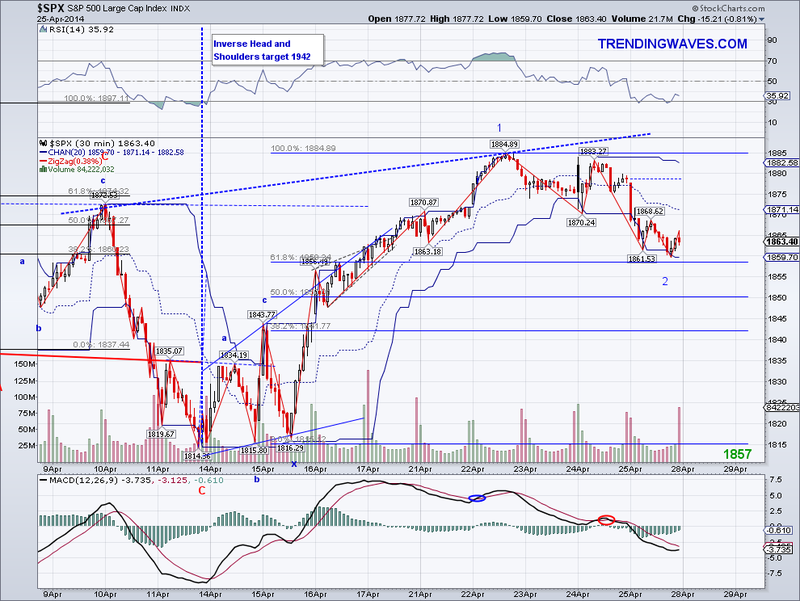 I was originally looking for yesterday's wave to reach the 1874-84 area but it felt short in the cash market. I had originally labeled that wave a B or a W2 so the current wave should tell us if we have seen the top for the next few months or if the market will stage a late surprise and reclaim its bullish momentum. The ideal target for the C wave is 1812 (which implies a correction and a resumption of the bullish trend) but it can be 1.618 of A so 1775. 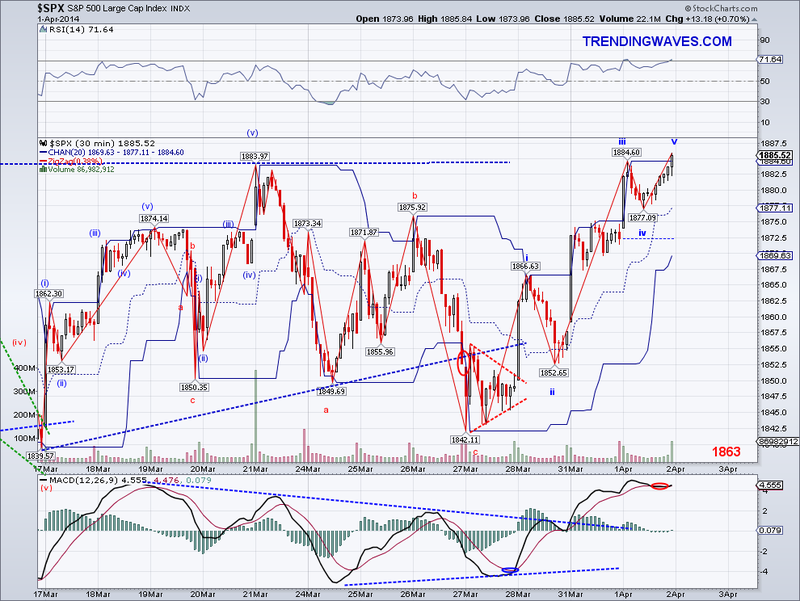 If this is a W3 then a 5 wave count should reach 1740-50 on the "conservative" side. As it stands, I see a Head and Shoulders targeting 1780 and 200 Day Moving Average at 1760 which should be a magnet for both short sellers and bullish buyers. These targets are all likely as long as the market is prevented from recapturing the 50 Day Moving Average. The only thing that I see as bullish is the permadoomster Marc Faber babbling today about how 2014 will be worst than 1987.. this from the man who was "100% sure" of a global recession in 2013 and pretty much every single year before that.. Now, if Robert Prechter from EWI gets any media time, then you know we have bottomed.. lol. The market was not so kind to me as to allow me to buy VXX by reaching my original target but it's ok. I did manage to make some money for my coffee fund buying XIV at the 50 DMA and selling it on the small bounce (+27/-6). I am on the sidelines except for my ST and LT China positions, which actually have been doing well. 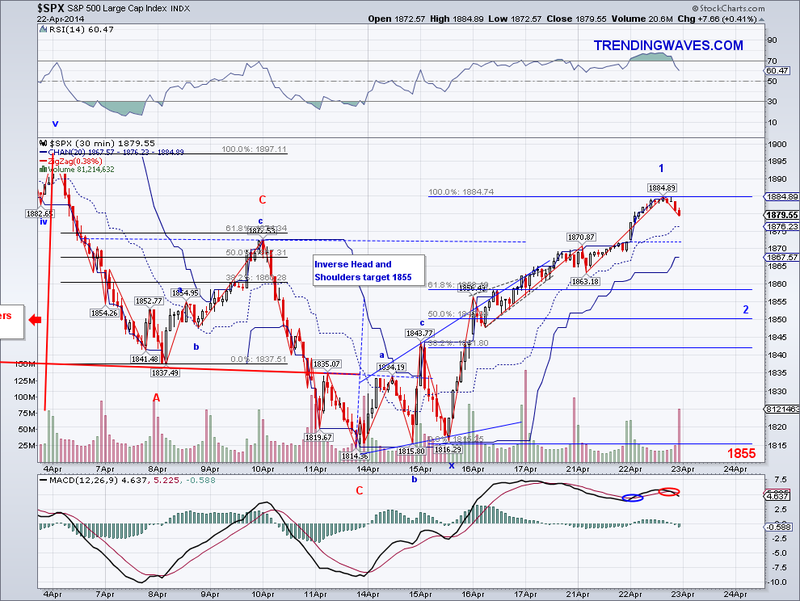 But I will attempt to catch a bounce at the levels I mentioned by buying XIV again. The market continued to rally as I had been expecting and managed to close over the Trend Average and what remains to be seen now is whether it will reverse to put in a lower low or go for another all time high. 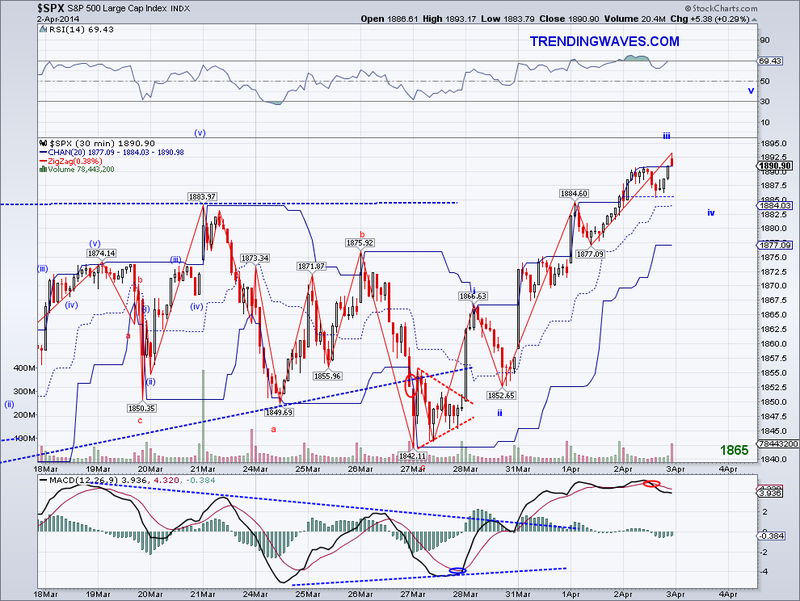 Given the timing, I lean towards more upside but I am not betting on it until the TA turns bullish again. I ended up selling my XIV (+26/-6) for a profit as planned and now I am on the sidelines to see how the market behaves at the 1874-84 level. The short term trend will turn bullish again if the market closes above the TA again tomorrow. The market was not done going down yesterday but with today's leg testing the 50 Day Moving Average (the first test in 2 months) we should see the bounce I posted about yesterday materialize. 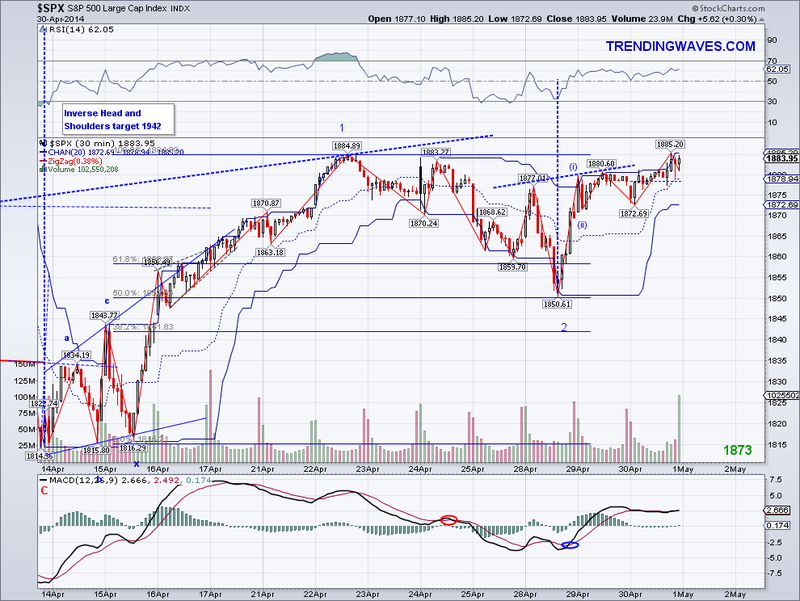 The difference is now the potential micro W1 is longer so a bounce could challenge the 1880 area again. With earnings season in play, this is the bulls chance to recapture yesterday's lost Trend Avg. Also, we have to keep in mind that this recent sell off came from a no news environment. So things could turn around if companies manage to surprise to the upside, specially high tech. 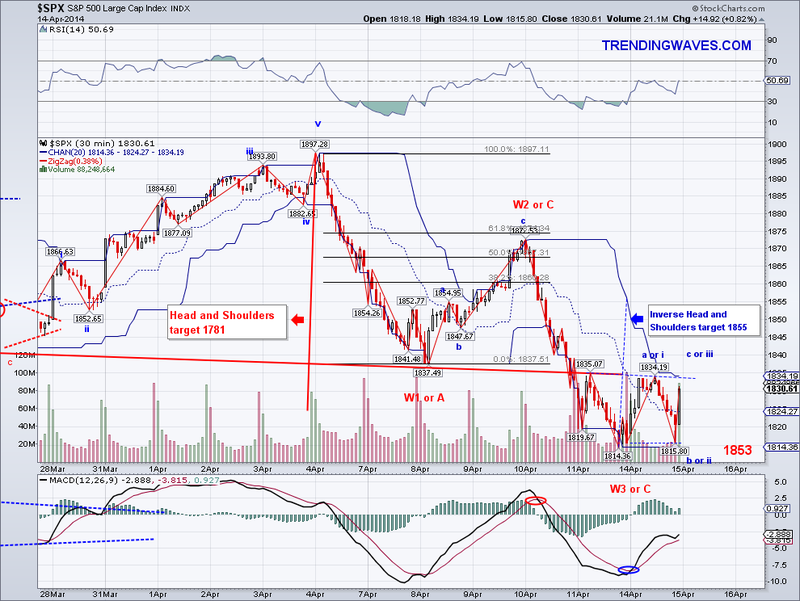 I continue to hold to my XIV as there might be a gap up tomorrow or a substantially counter rally. 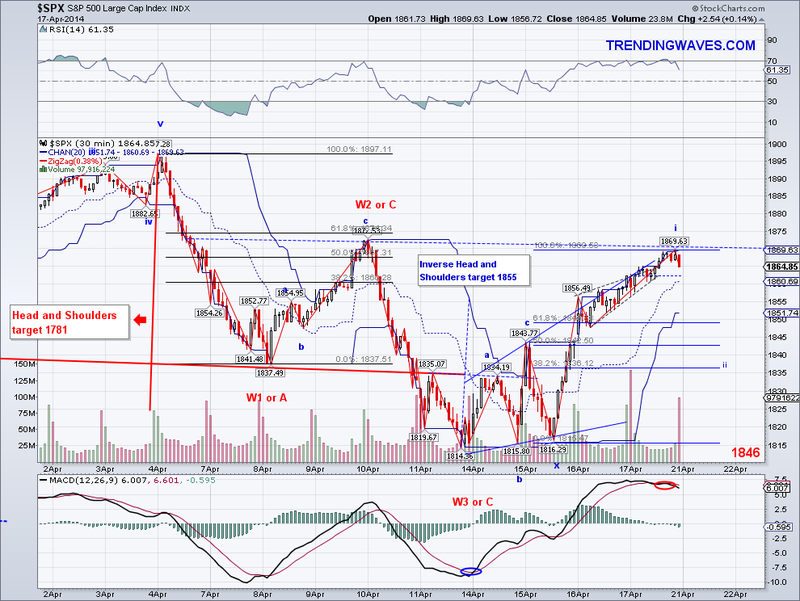 Once those waves are in, I will get back into VXX but it will depend on where the market trades relative to the TA. 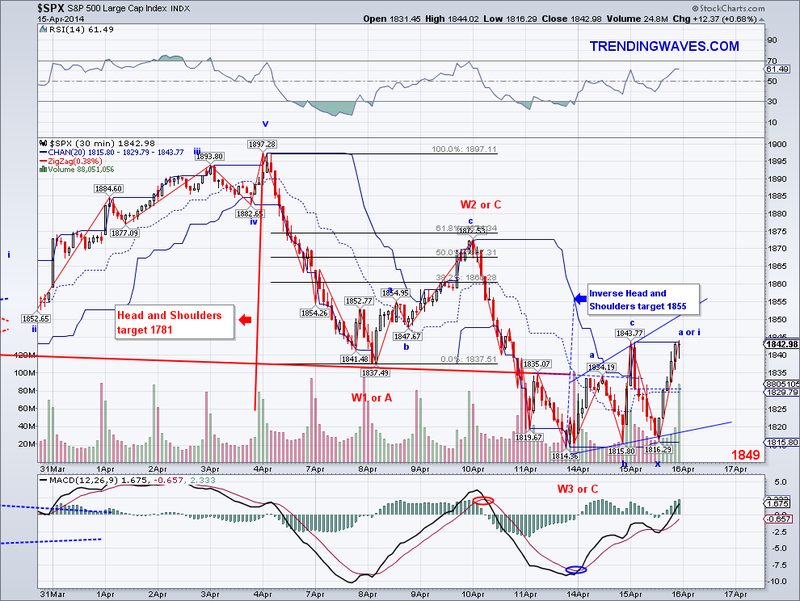 The correction on Friday was expected after having a 5 wave move completed that day. However, the lower low made today wiping out all gains from that 5 wave count came as a surprise to me as bulls had the momentum after all the seemingly negative news had failed to produce even a 50 DMA test. But today's low changes the Short Term Trend to bearish and unless the market rallies hard above the Trend Average, my guess is that the Intermediate Trend will change as well. The market could still put in a new high and form a Megaphone top or it could just rally to the TA or the 1874-83 area and then reverse to put in lower lows. 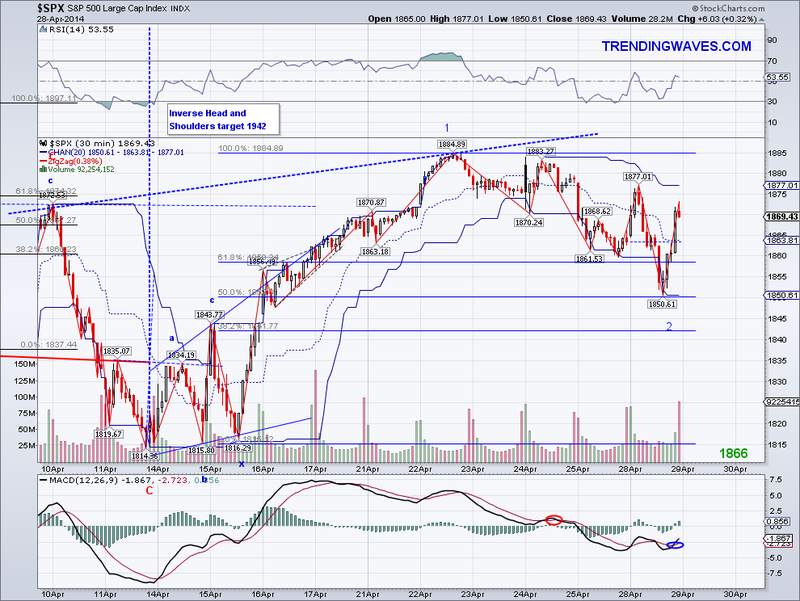 Looking at the micro count, if 1841-52 was W1 then I am expecting 1870 as the target and a good spot to start hedging. I didn't get a chance to position trade the XIV I have since I didn't catch the first support level that broke. But since it didn't really go down all that much either I think I can still make a profit on it on a test of the Trend Average so maybe we'll see the TA tomorrow. Whether the market can recapture it is another question. I will probably start loading up on VXX at resistance to hedge my long positions, which actually have been rallying. The market fell couple of points short of the measured target for the SP500 I had but nonetheless it made an all time high again and now there is a complete 5 wave structure from the 1842 correction low. 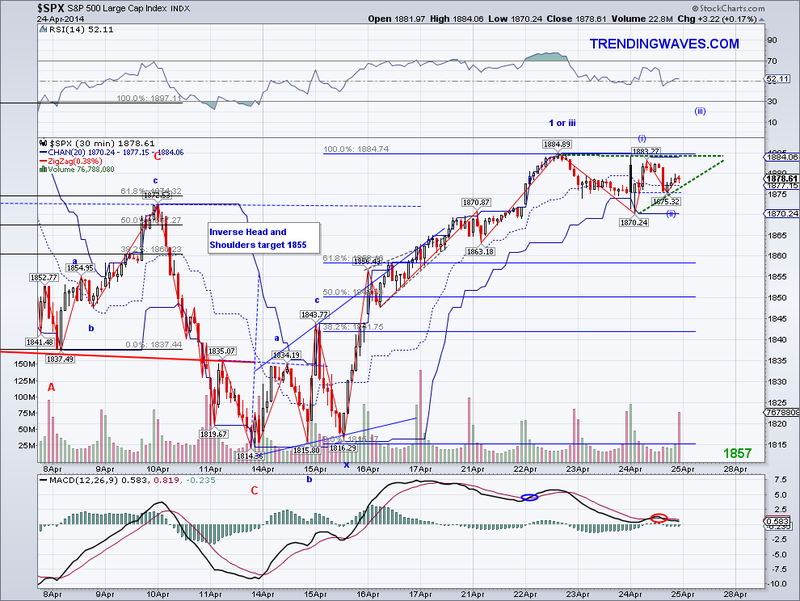 I normally expect a Trend Average test after 5 waves are completed but the move today to the TA was swift. 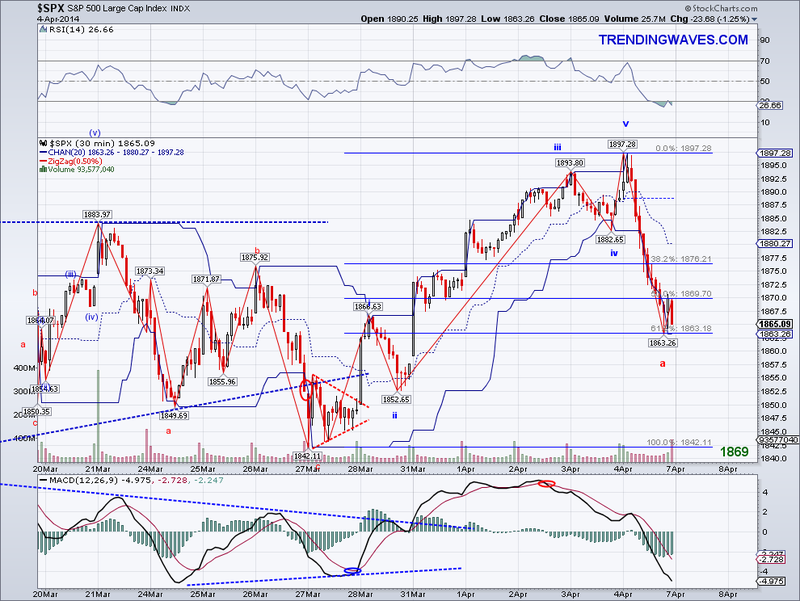 However, it seems like this particular leg found a bottom at 1863. 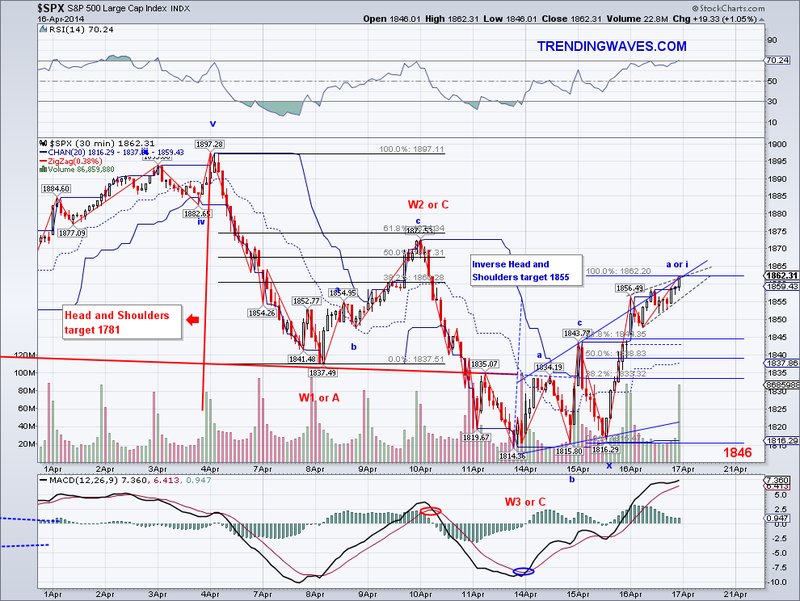 The ideal correction for a W2 is usually a Zig Zag but obviously anything can happen. So we could either see 1884 challenged before the bearish C leg or the rally could simply resume after today's sell off. I am keeping an eye on how the market closes relative to the TA as the trend needs to be bullish for higher highs to materialize. As it stands, the bullish short term trend is being challenged. I executed my plan to buy back the VXX I sold yesterday near the high and closed the position profitably at the test of the TA (24/29). 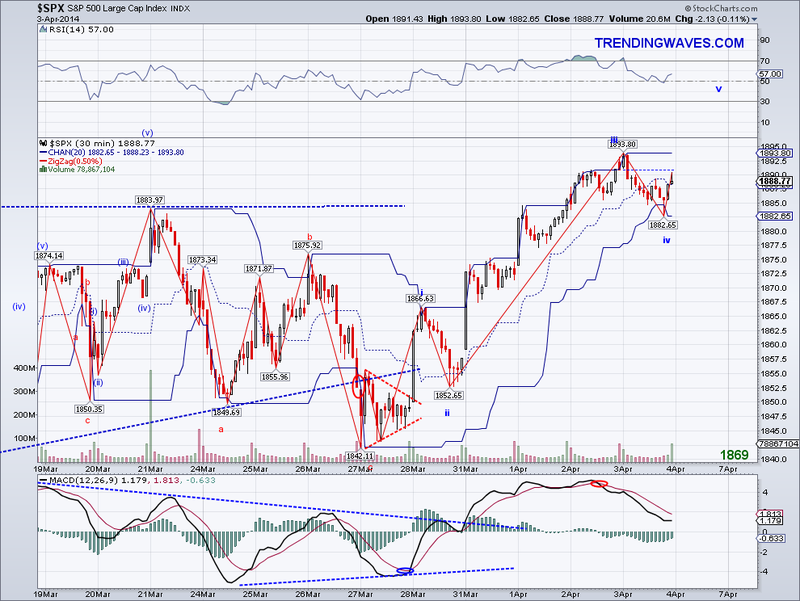 I also day traded the pharma stock I sold the other day (25/29) and I bought XIV which I am holding over the weekend. 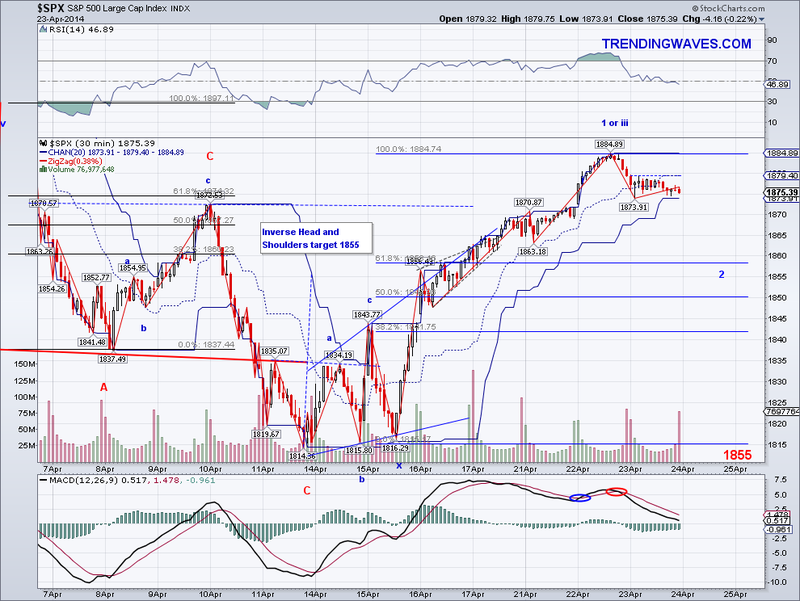 Hopefully, we'll get a strong bounce on Monday to 1884 so I can sell some or all of XIV. However, if today's support is broken on Monday I will probably position trade it/hedge it as 1852-55 would likely be tested. The market corrected as expected on what seems to be the micro W4 on the chart and if the reversal that followed is the W5 then we're looking at 1906 as soon as tomorrow. I added the length of W1 to today's low to come up with the target which is in the original range I had talked about when resistance broke. So I assume whatever news we get tomorrow is going to be used as an excuse to rally. My VXX position did not go into positive even with today's correction but I sold it as a position trade. So I will be buying it back in the 1900's or in the 39's hopefully..
Another day, another all time high. I won't be surprised if we see several highs this month now that the market is clearing resistance. I relabeled the charts to reflect the end of micro W3 today but I think the market will not correct significantly until 1900 is reached, specially it's so close to that number. And once we see 1900, why not make it a nice round number like 2000! I know some people feel the market is generally overbought (myself included) but the trend is clear at the moment and there's no point in fighting it. I won't be surprised if we see 2000 before the usual summer correction, which btw should provide an opportunity to go long for those that have been waiting on the sidelines and missing out all the upside in the last few years or worst yet shorting a market that has essentially tripled since its 2009 low. The market followed the count I had on the chart yesterday and it seems like it is finally going to break out of range. Going by wave proportion and my usual rough estimates with W1, a 5 count should take the market to 1900-05 which should happen just with with short covering alone if resistance breaks convincingly. The Trend Average has now turned bullish again and as I mentioned before we could see a big rally from here given then fact the market has corrected enough for another multi-week rally that could easily add another 100 points before taking another break. I ended up buying some VXX to hedge longs but I might position trade them depending on how the waves evolve tomorrow.